Date | Time Friday, Oct. 27 | 7:30 p.m. The Guelph Storm will be hosting the Erie Otters at the Sleeman Centre this Friday, October 27th for the first stop of a home and home. Puck drop is set for 7:30 p.m and will be the first of 6 meetings between these Midwest Division clubs this year. Last season, the Erie Otters claimed wins in 4 of the 6 games between the clubs so the Storm will look to get off to a solid start with their game on Friday. Coming off an Ontario Hockey League Championship win, the Erie Otters have yet to display the dominance that helped claim them the honor last May. The Otters lost a lot of star power this off-season with the departure of Dylan Strome, Darren Raddysh, and Alex Debrincat to name a few. The new-look Otters have allowed 48 goals while posting 44 offering a goal differential of negative 4. This is a rare sight for the team who hasn’t had an issue with their offensive production over the years. In fact, they haven’t finished a season with a negative goal differential since the 2012-13 season. The Erie Otters are coming off an undefeated 3-game home stand where they outscored their opponents 15-11. They have been very strong at home this season with a 4-1-0-0 record, however, their struggles have come on the road where the team currently has a 1-5-1-0 record. 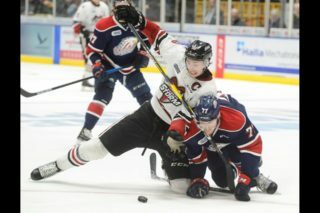 The Ontario Hockey League’s third youngest team has had their ups and downs throughout the season. However, the Storm are coming off a solid weekend where they went 2-1, beating Hamilton and Saginaw before losing to Sault Ste. Marie on Sunday. The Storm have been hovering around a 0.500 winning percentage this season, look for them to make a strong push over the next few weeks to increase their footing in the Midwest Division. There will be no shortage of NHL prospects at the Sleeman Centre this Friday. A total of 10 players between the two rosters have been drafted into NHL, consisting of Guelph’s Liam Hawel (Dallas Stars), Nate Schnarr (Arizona Coyotes), Alexey Toropchenko (St. Louis Blues), Mark Shoemaker (San Jose Sharks), Isaac Ratcliffe (Philadelphia Flyers), Givani Smith (Detroit Red Wings) and Dmitri Samorukov (Edmonton Oilers) in addition to Erie’s Taylor Raddysh (Tampa Bay Lightning), Ivan Lodnia (Minnesota Wild) and Jordan Sambrook (Detroit Red Wings). The Erie Otters’ first line has been dominant of late, each riding significant point streaks leading into Friday’s contest. Taylor Raddysh’s 6 game streak, (3 goals, 8 assists), Kyle Maksimovich’s 7 game streak (4 goals, 8 assists), and Ivan Lodnia’s 7 game streak (8 goals, 2 assists) give them a combined 33 points in the last 7 games. The trio will be looking to continue this streak with a strong performance against the Storm. As for the Guelph Storm, look for a few players to find more offensive production after busting out of their slumps this weekend. Isaac Ratcliffe ended his 6-game goalless streak with a solid 2 goal effort against Saginaw this Saturday. 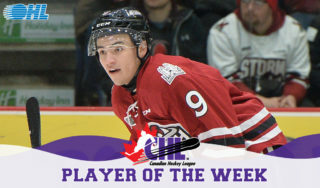 Similarly, defenseman Ryan Merkley ended his 5-game pointless streak with a strong effort against Sault Ste. Marie recording a goal and an assist in a 7-4 loss. After busting out of these streaks, Ratcliffe and Merkley are poised for a solid increase in production in the weeks to come. 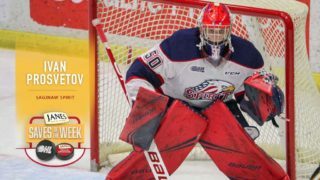 Look for continued solid play from Storm goaltender Anthony Popovich who was named the Storm’s player of the week last week after posting a 2.69 goals against average and a 0.935 save percentage in three starts last week. The Belleville native turned away 116 shots in three games. The game will also feature several of Guelph’s draft eligible prospects, three of which have been listed on NHL Central Scouting’s 2017-18 Players to Watch List. 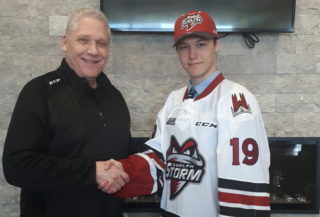 Guelph Storm star defencemen, Ryan Merkley, is one of only 24 players to receive an “A” rating which indicates a 1st Round Candidate for the upcoming NHL draft. Other eligible prospects to appear on the Players to Watch List include Owen Lalonde and Cameron Hillis. Oosterveld Heating and Air Conditioning’s second annual Winter Wear Drive in support of Hope House is next Friday, October 27th at the Sleeman Centre when your Storm host the Erie Otters. Last year Storm fans generously donated over 70 adult coats, 9 pairs of snow pants, 16 youth jackets, seven baby coats, 43 scarves, six pairs of boots, approximately 30 pairs of new socks and a lot of winter hats and gloves! Help keep our community warm this winter. When you enter the rink, volunteers will be on hand to collect your much needed gently used or new hats, coats, boots, mitts, and scarves, in support of Hope House, which is a non-profit organization helping to overcome poverty in the Guelph area by providing tangible, compassionate assistance and care to those in need in the community. Fan’s who bring donation items will have a chance to win some great prizes during the game. For more information, to volunteer or donate please visit www.lakesidehopehouse.ca or call (519) 265-4299. 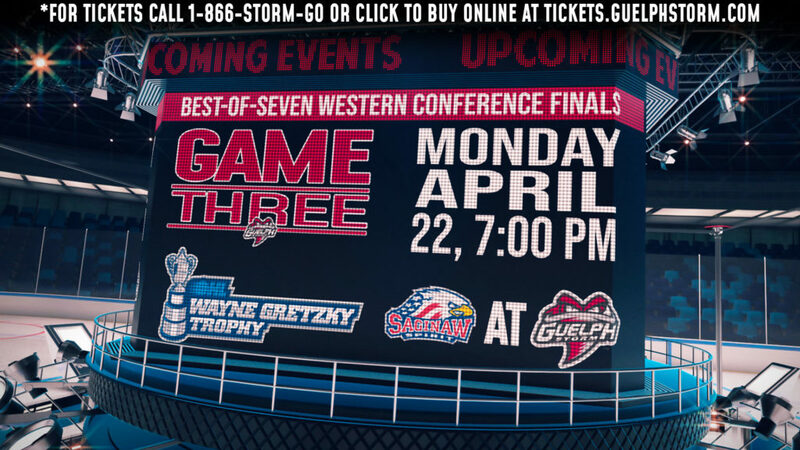 The Guelph Storm will face-off against the London Knights this Sunday at the Sleeman Centre. 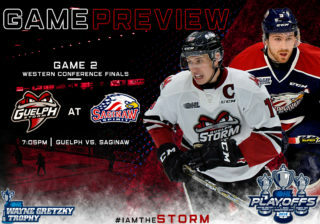 Puck-drop is set for 4 p.m.
or online at ticketmaster.com here.